Fabulous antique Chinese table apron textile with 4 gold dragons, (originally had nine), above water on a blue silk background with auspicious Buddhist symbols and a two inch floral border of peonies, irises, and butterflies in blues and white, the border possible was added at a later date. Excellent condition dating from the 19th century. Measures 62" wide by 36" long. Sashiko stitched fabric. Tsutsugaki dyed cloth. Indigo background with red and white design. Two horizontal bands wrap around bottom of coat. 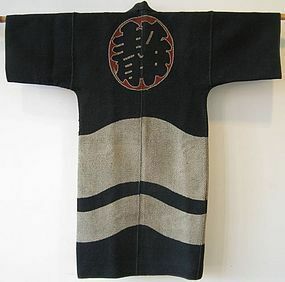 Similar to reference work "Sumi Collection Hanten and Happi" coats on page 25. Used by firemen in late 19th century Japan to extinguish blazes. Hook and eye closure. Measures 49" sleeve to sleeve 49" long. Overall good condition, small wear on neck and side. 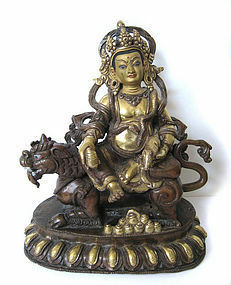 Gilt bronze figure of Kubera (Kambala) also known as Dhanapati "Lord of Riches", seated on mythical beast with mongoose in one hand, his elaborate crown and round belly suggest great wealth, Nepalese, early/mid 20th century. Size: 7 1/2" high x 6 1/4" wide x 4" deep. 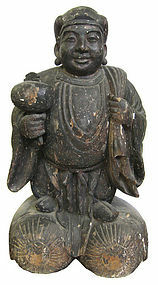 Wonderful large Japanese carved wooden figure of Diakuku, one of the Lucky Gods, he stands on two bales of rice and he holds a large sack on his back, lacquered wood, sweet expression, lacquered wood, this piece is 17th century. Size: 36" high x 21" wide x 19" deep. 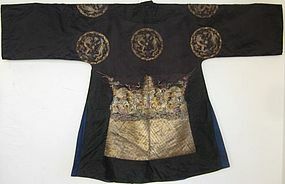 Antique chinese black dragon and phoenix roundel robe on dark navy ground. 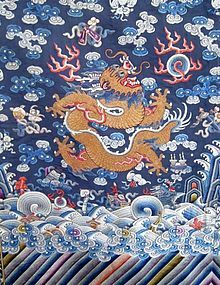 Roundels embroidered with gold phoenix and dragon writhing over clouds and waves. Sliver and gold thread with red and green couching stitches. Roundels are appliqued on. On the back of the robe there is peach and jewels and the wheel of life on large back panel. Small overall wear and discoloration. 40" long x 62" sleeve to sleeve. Republic period. Circa 1900-1920s. 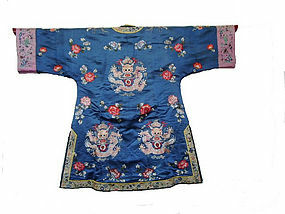 Chinese antique ladies blue silk embroidered dragon coat, with 7 dragons and peony flowers and butterflies, bordered with white background with small figures and flowers. Dimensions:39" long, 52" sleeve to sleeve. 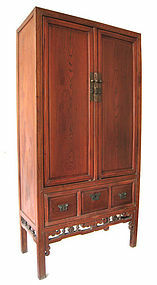 Large Chinese cabinet, made of jumu (elm) wood with beautiful grain, original deep red translucent lacquer finish, interior with 2 shelves, bottom shelf has two built in drawers, exterior has 3 drawers with butterfly locks, 19th century. Size: 85" high x 42 3/4" wide x 20 3/4" deep.